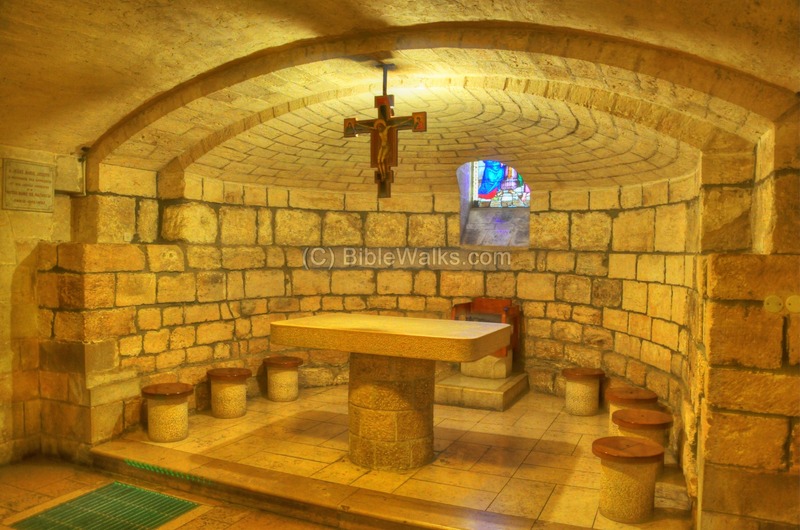 The church is located, according to early traditions, over the carpenter workshop of the Holy family. 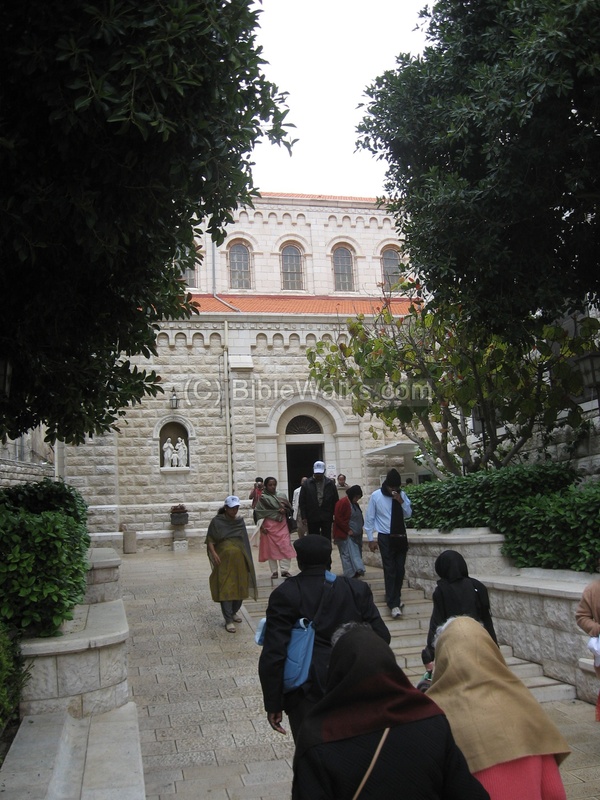 Later traditions identify this place as the house of Joseph and the Holy family. Matthew 1:16: "...Joseph the husband of Mary, of whom was born Jesus, who is called Christ". The St. Joseph church is located, according to early traditions, over the carpenter workshop of the Holy family. Later tradition identify this place as the house of Joseph and the Holy family. The church is located adjacent and north to the Basilica of Annunciation in Nazareth. Between the churches is the large Franciscan convent - Terra-Santa (Holy Land). The cave under the church were used by the early dwellers in the Roman period as a water and food storage place under the house, which is typical of the residential houses at that time. The place was converted to a worship place in the Byzantine period, since the tradition identified the place as the workshop and home 0f the Holy family. During the Crusaders period, in the 12th CAD, a church was built over the site of the Byzantine church. This was the church of the Nutrition, or St. Joseph's House. It was destroyed by the Arabs (1263AD) after the defeat of the Crusaders. 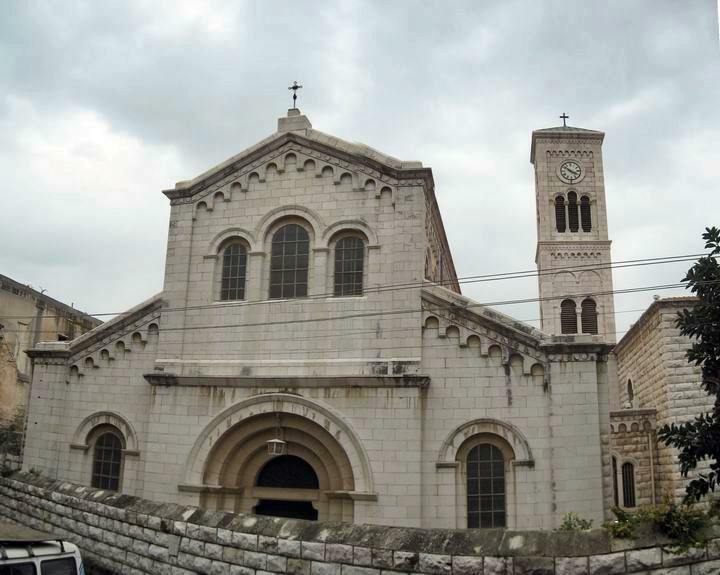 During the Ottoman period the ruins of the Crusader church was acquired by the Franciscans in 1745, and the first chapel was built in 1754. 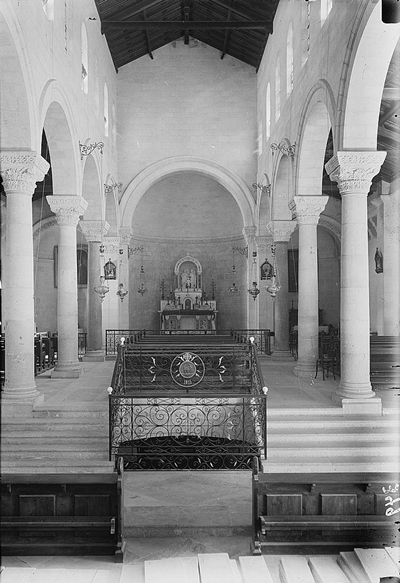 A photo of the church in 1900, before it was renovated, is shown on the right. The new church was rebuilt by the Franciscans in 1914 on top of the earlier churches and cave. Today it is frequently visited by pilgrims and other visitors. The photo shows the west side of the church, as seen from the street behind the walls. This is the view from the south - the public entrance to the church. 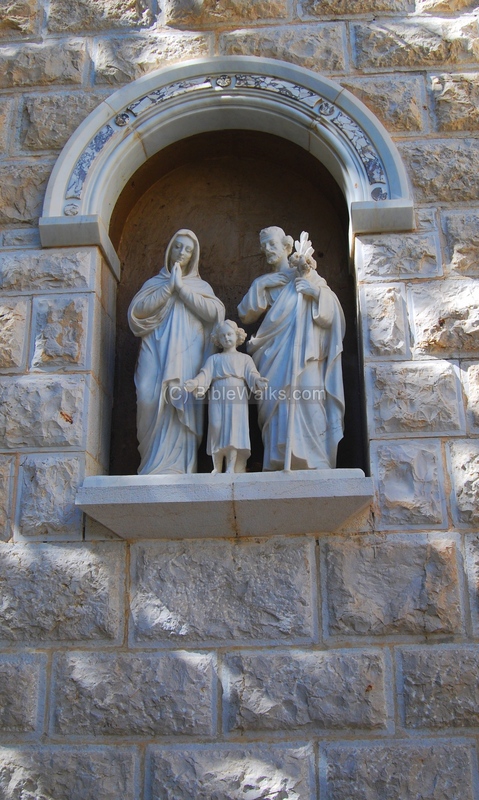 In the wall to the left of the door is a statue of the Holy family - Virgin Mary, St. Joseph and young Jesus. 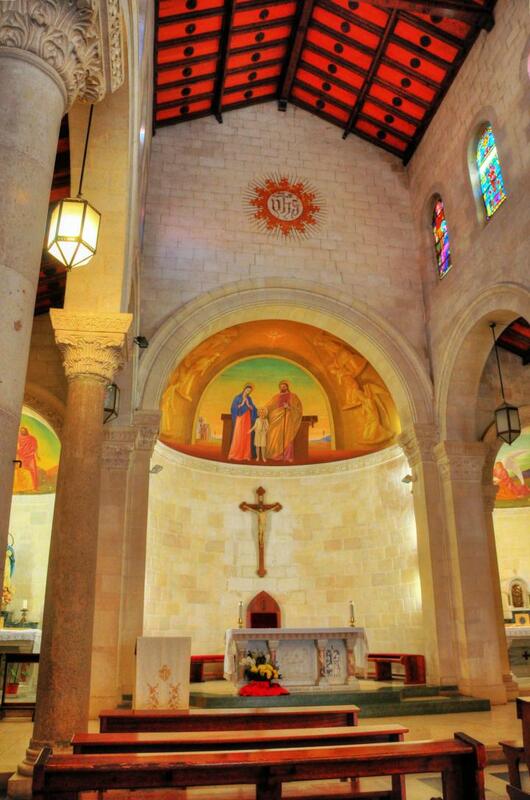 The following picture shows a view of the altar in the main hall of the church. 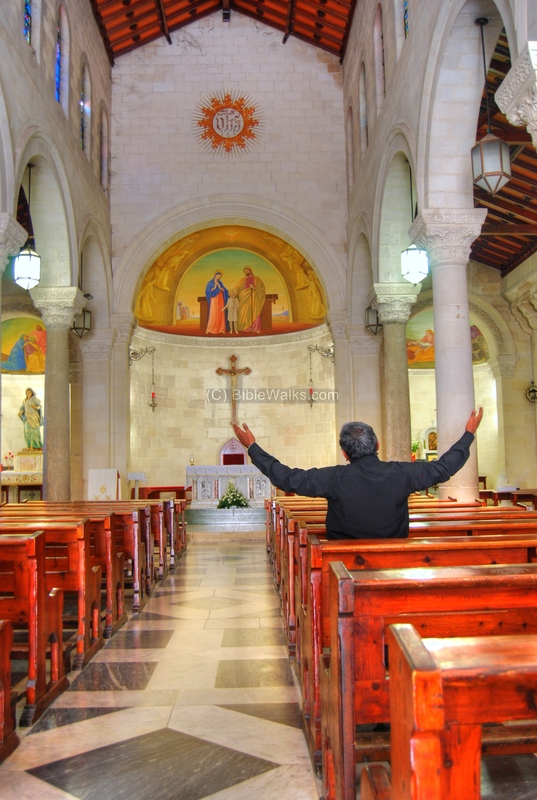 A man is praying on the benches, holding his arms up in the air for minutes long (a fascinating scene). 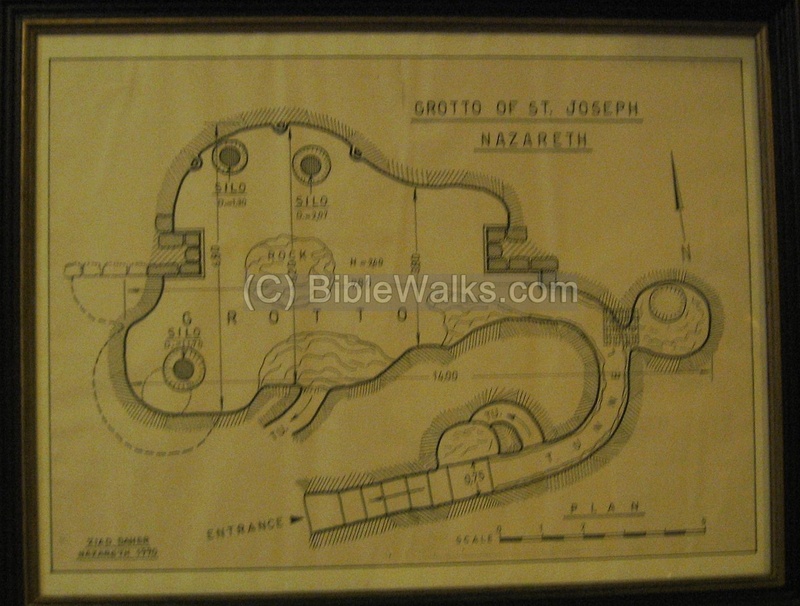 On the right side are stairs that lead under the church to the grottos. 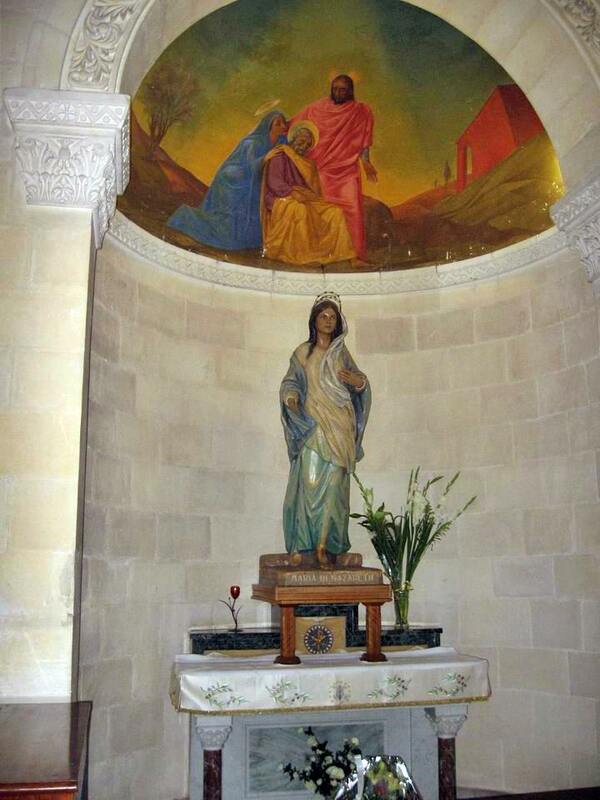 A corner of the side of the main hall, with a painting of the Holy family and a statue of Virgin Mary. 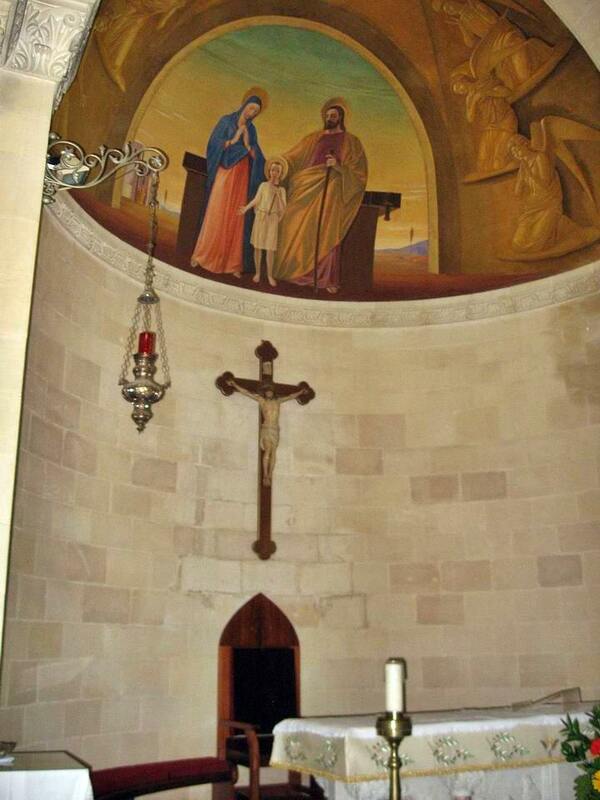 Another side of the church, with a wall painting showing St Mary and St Joseph with young Jesus. 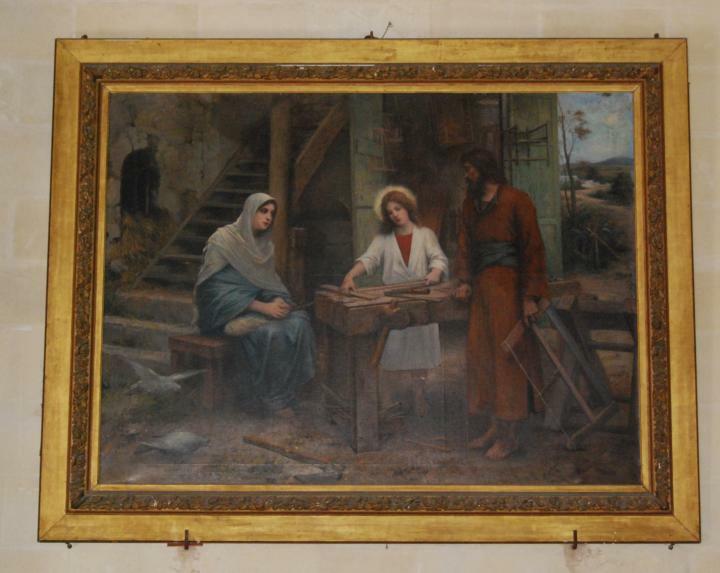 A painting of Virgin Mary, St. Joseph and the young Jesus in the carpenter's workshop. 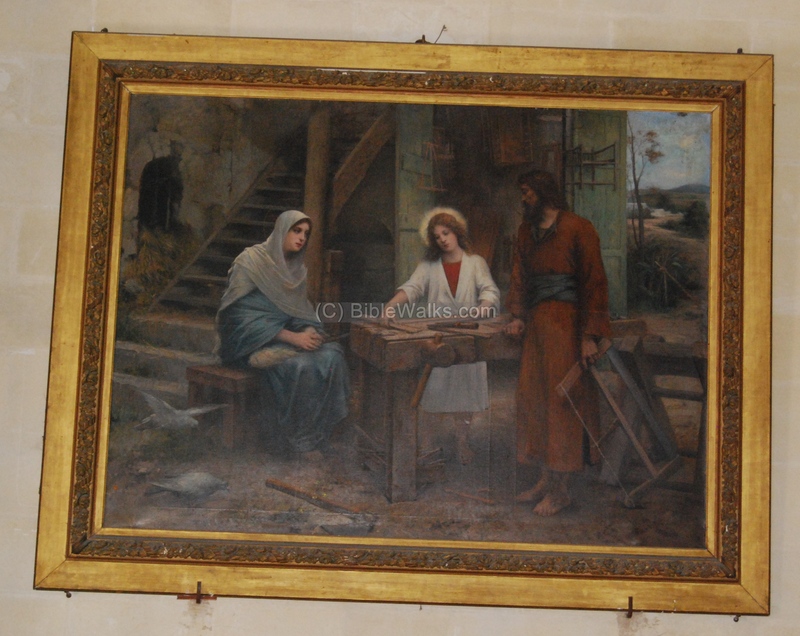 Early traditions identified the site of the church as the place of the carpenter workshop of the Holy family. 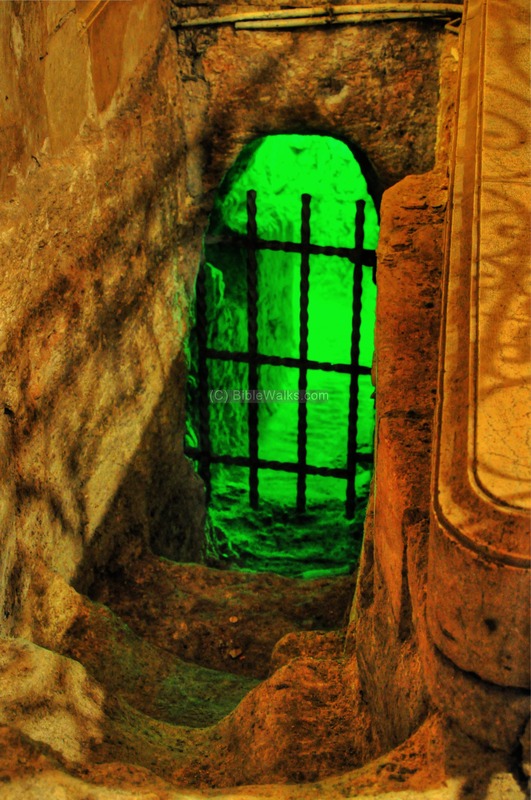 Under the church is a series of rock-cut installations and caves that were in use by the Roman-period dwellers. 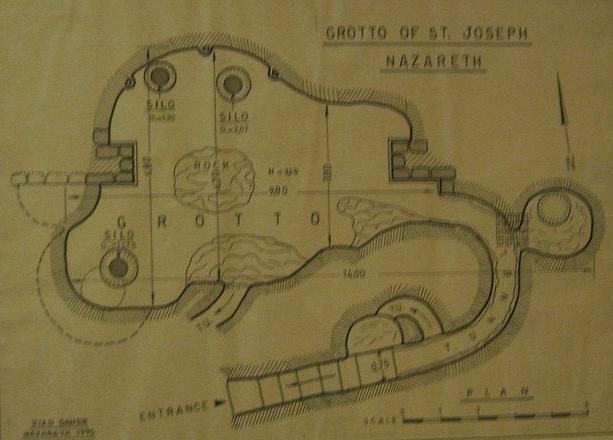 The following map, on display in the church, shows the plan of the grotto, which contains silos and storage places. The size of the cave is 10M x 4.5M x 2M height, and is accessed by 9 steps. On the west side of the grotto are colored glass windows. 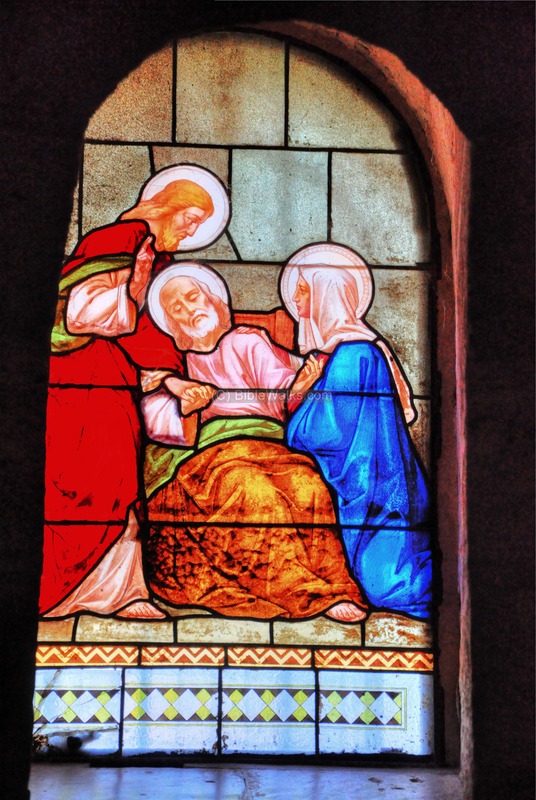 The painting below shows the marriage of Mary and Joseph. Another vit'rage shows Jesus, Virgin Mary and St. Joseph. 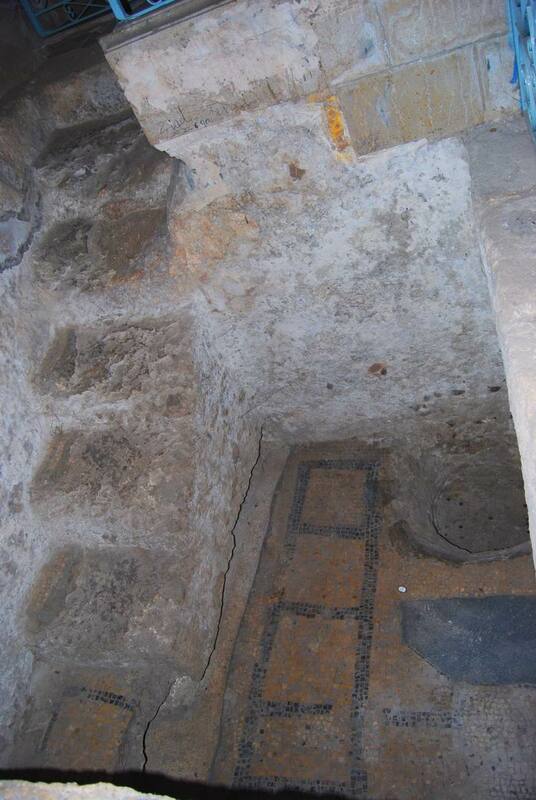 One of the rock-cut cavities were converted to a Baptismal pool with a mosaic floor, part of the Byzantine worship place of the church which was built over the early cave. Steps lead down to the pool on the left. 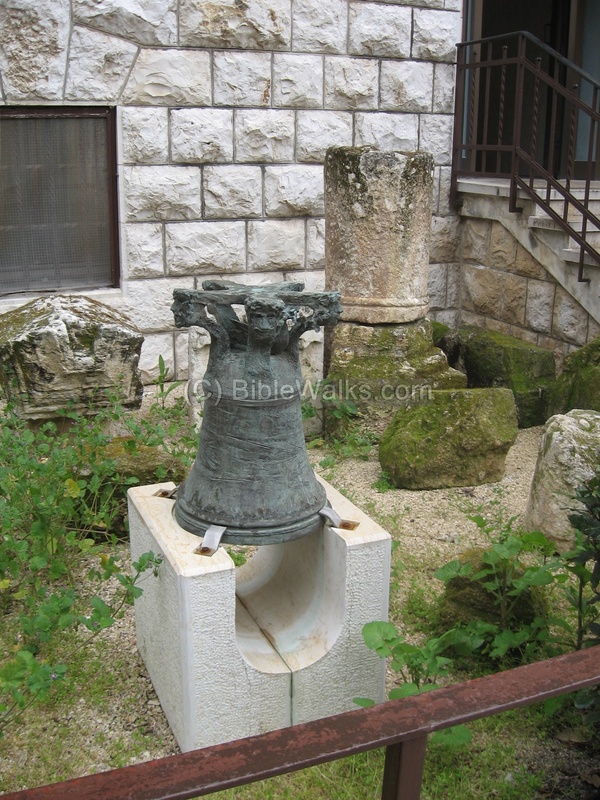 In front of the Terra-Santa convent there is a small collection of archeological artifacts that were found in the excavations around the church. In the garden there is also the statue of a Franciscan saint (thanks for comment by Ruth Konda). 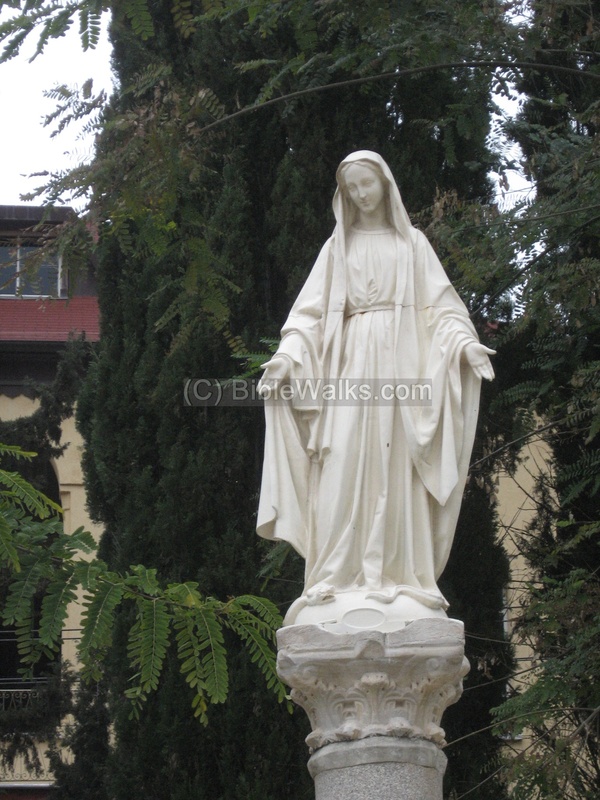 Another statue is of Virgin Mary, placed in the Millennium year 2000 as inscribed on its base. 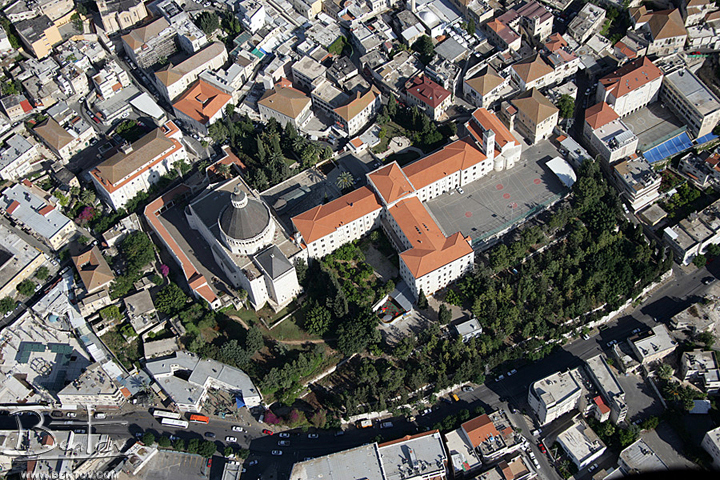 The following aerial photo shows the churches district, with the grey dome of the Basilica of Annunciation in the left-center. In the center of the photo is a "T" shaped long structure with orange tiles. The Terra Sancta Convent is located in the center of the "T". St. Joseph's church is located on the right (North) side of the "T"- its tall tower can be seen between the church and the convent. 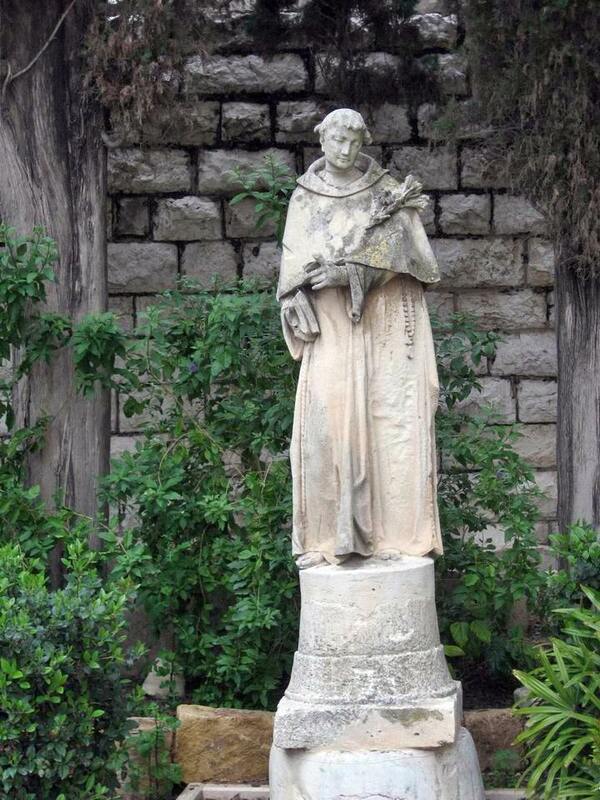 In the area between the convent and St. Joseph church is the small garden. This text tells about Joseph, the foster father of Jesus, and the angel appearing to him and revealing him the planned birth of Jesus. The text also refers to Isaiah's prophecy of Emmanuel (see etymology below). 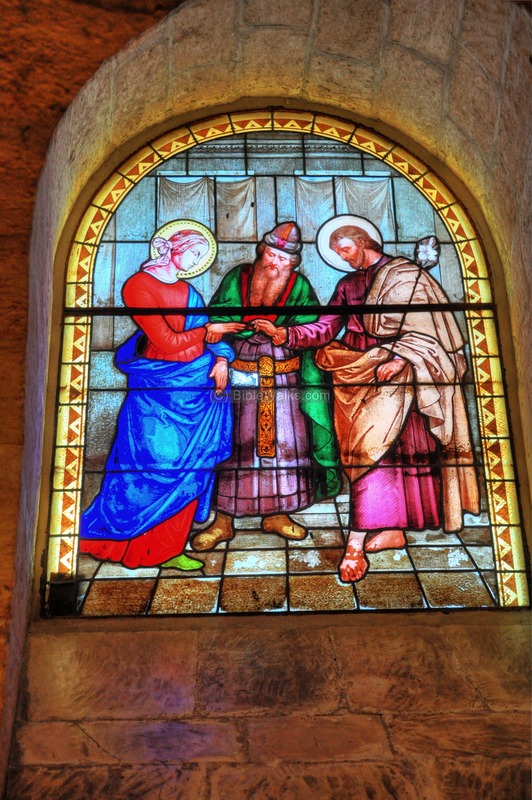 "And Jacob begat Joseph the husband of Mary, of whom was born Jesus, who is called Christ. So all the generations from Abraham to David are fourteen generations; and from David until the carrying away into Babylon are fourteen generations; and from the carrying away into Babylon unto Christ are fourteen generations. Now the birth of Jesus Christ was on this wise: When as his mother Mary was espoused to Joseph, before they came together, she was found with child of the Holy Ghost. Then Joseph her husband, being a just man, and not willing to make her a publick example, was minded to put her away privily. But while he thought on these things, behold, the angel of the Lord appeared unto him in a dream, saying, Joseph, thou son of David, fear not to take unto thee Mary thy wife: for that which is conceived in her is of the Holy Ghost. And she shall bring forth a son, and thou shalt call his name Jesus: for he shall save his people from their sins. Now all this was done, that it might be fulfilled which was spoken of the Lord by the prophet, saying, Behold, a virgin shall be with child, and shall bring forth a son, and they shall call his name Emmanuel, which being interpreted is, God with us. Then Joseph being raised from sleep did as the angel of the Lord had bidden him, and took unto him his wife: And knew her not till she had brought forth her firstborn son: and he called his name Jesus". 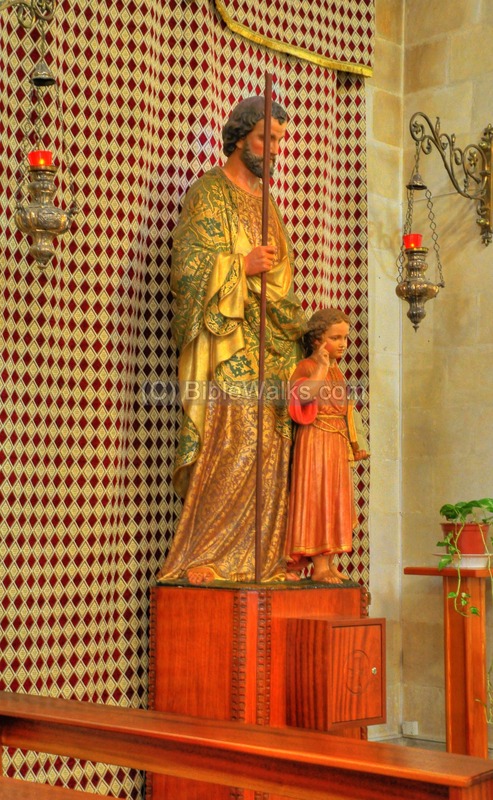 The place of the church was considered first (7th C) as the workshop of the Holy family, which were carpenters. Later they identified the site as their home place. 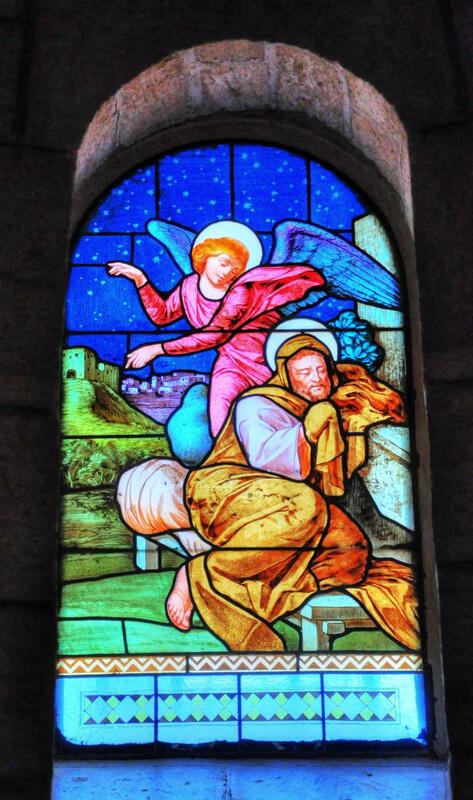 Joseph - The source of the name in Hebrew is Yosef, which means Yo (God) + Sef (add). Thus the name means "God shall add". The Bible provides this meaning in the following Biblical reference: Genesis 30: 24: And she called his name Joseph; and said, The LORD shall add to me another son. Emmanuel - The source of the name in Hebrew: Immanu-El, meaning God (El) + Immanu (with us), or "God is with us". This is also explained in Mt 1:23: "...and they shall call his name Emmanuel, which being interpreted is, God with us". This name refers to Jesus, and relates to prophet Isaiah's prophecy (7:14): "Therefore the Lord himself shall give you a sign; Behold, a virgin shall conceive, and bear a son, and shall call his name Immanuel". Isaiah further describes Emmanuel's acts in 8:8: "And he shall pass through Judah; he shall overflow and go over, he shall reach even to the neck; and the stretching out of his wings shall fill the breadth of thy land, O Immanuel".